David W. Frisch was appointed to the position of Chief of Police in July, 2017. He began his career with the City of Lapeer Police Department in 1987 as a reserve officer, becoming a full time officer in 1990. Dave has served the department as a Patrolman, Shift Sergeant, Administrative Sergeant and Lieutenant before becoming the Chief of Police. While rising through the ranks he served as a DARE Officer, Major Traffic Crash Investigator, Alcohol Enforcement Officer, Field Training Officer, Field Training Supervisor and Department Public Information Officer. Dave is a graduate of the Northeastern Academy at Delta College, Michigan State School of Staff and Command and the Law Enforcement Executive Leadership Institute. 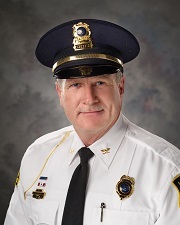 Dave currently serves on the Board of Directors for Lapeer Area Citizens Against Domestic Assault (LACADA), The Lapeer Leader Fund, The Suicide Prevention Network and is Past President of the Lapeer City Police Officers Charitable Fund. It is my honor to serve as Chief of Police in the City of Lapeer. I welcome you to our website and thank you for taking the time to learn more about the City of Lapeer Police Department. I strongly believe that the City of Lapeer Police can and will do more than just enforce the criminal and traffic laws. We will be a strong partner with the Citizens, Business Owners and Customers that we serve, while working collectively with our area law enforcement partners. We will provide Fair and Equitable police services to all persons at all times. The men and women of the City of Lapeer Police Department are properly trained, equipped and prepared to respond quickly to all emergency and daily calls throughout our City. Through community outreach programs such as; Senior citizen driving programs, Officer in the schools full time (SRO), Bicycle patrol of City Parks and involvement with festivals and special events our officers are ready to provide services and assistance to those we have the privilege to serve. As with all police departments we cannot do it alone. Become involved within your community, we need your help in reporting suspicious activity, crimes and traffic problems. Working together we can keep the City of Lapeer a safe place to work, live and enjoy a high quality of life.